Game Masters shouldn't waste precious time sketching every time an adventure calls for a centre of learning or magical laboratory. With GameMastery Map Pack: Magic Academy, you'll be ready next time you run across sorcerous scoudrels who need to be taught a lesson! 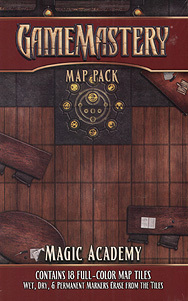 Also check out Pathfinder Module: Academy of Secrets, the tie-in that transforms GameMastery Map Pack: Magic Academy into a complete adventure!